New York, NY (April 26, 2017) - Spearheading the effort to merge the two worlds of comics and music, Marvel Entertainment's Marvel Playback opens up conversation with some of music's biggest names. GRAMMY® nominated Skillet's John Cooper joined Marvel's Playback to speak about his love for comics, and the lessons he's learned from their stories and heroes. That video can be seen here: https://youtu.be/lKryE-HOg_A. Earning three Billboard Music Award Nominations, their most recent album, Unleashed, debuted at No. 3 on the Billboard Top 200 Album Chart. The group's latest single "Back From the Dead," continues to climb the charts, hitting No. 9 on the Active Rock Chart, and No. 10 on Billboard's Christian Rock Chart. The new single comes on the heels of the debut track “Feel Invincible” that went to #1 at Active Rock radio. "Back From The Dead" is also set to be used in SyFy's new series, Blood Drive. The episode featuring the Skillet track will be the premiere of the show on June 14th. 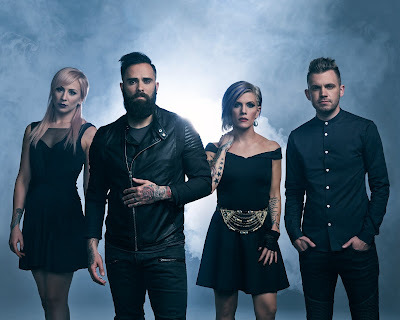 Skillet has announced they will be extending their "Unleashed Tour" with the addition of three more shows. After recently wrapping three legs of their headlining tour with sold-out dates across the U.S. and Europe, the group has decided to extend the tour to Memphis (June 6th), Orlando (June 8th), and Atlanta (June 9th). These dates come alongside already announced festival dates including Carolina Rebellion, Rock On The Range, Loudwire Live and Rise Above Fest. The band will also be joining Korn and Stone Sour on the Serenity Of Summer Tour in July and August.